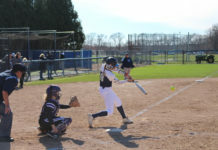 The Rhode Island women’s softball team’s sweep of Norfolk State was a big boost for the team after they had just been swept in a doubleheader versus Norfolk State the day before. In sweeping Norfolk State in the Sunday doubleheader, the team was able climb within two games of .500. They also won two different ways, prevailing in a low-scoring close game and a high-scoring game. Additionally, they were able to break up a three-game losing streak in the process. 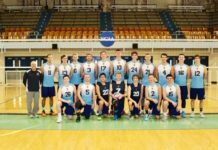 The Rhody men’s track and field team’s performance at the IC4A’s was excellent. They were able to place three top 10 finishers in their specific events, which continues the long line of tremendous performances the team has put together this year. This team has momentum heading into the spring season. The season-ending loss against Saint Louis for the URI women’s basketball team brings to a close one of the more disappointing seasons in the past few years for Rhode Island. Coming into this year, the hopes and expectations were high for the women’s team as they had built positive momentum last year and had a great player in Charise Wilson. However, there was never any traction, and although they put up a great fight against Saint Louis, their season ends much sooner than any of us thought going into the year. 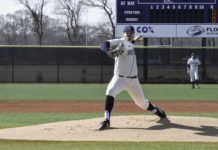 Rhody men’s baseball pitching has been brutal as of late. In their last four games, the Rams pitchers have given up 36 runs, nine runs per game. It is disappointing even more so because the Ram offense has scored 32 runs during that same time span. Janel Conley (ECAC’s) – Conley finished in second place in the 60-meter hurdles gaining eight points, but also came in eighth in the long jump, coming up with an extra point and giving her nine for the event. Alex McGrainer (IC4A’s) – McGrainer set a personal best on Saturday to advance to Sunday, and then set a personal best on Sunday while also finishing seventh in the event and posting the second best time in URI’s program history. Team of the Week: URI men’s track (IC4A’s) – The men’s track team had three athletes in the top 10 of their events and have built solid momentum for another run in the outdoor spring season. Off the Record: With the Celtics last home win, they have now won 13 games in a row at home. In the 28 games previous they had posted a 13-15 record.